Polypectomy is the procedure used to remove small polyps from the bowel well. This usually takes place during an endoscopic procedure such as a colonoscopy, flexible sigmoidoscopy or gastroscopy. Depending on its size the polyp is removed using either specialised forceps or a wire loop (snare) through the endoscope. In larger polyps because of the higher risk of perforating the bowel and bleeding a specialised solution is injected into the superficial internal layer of the bowel (mucosa) in order to lift the polyp up. 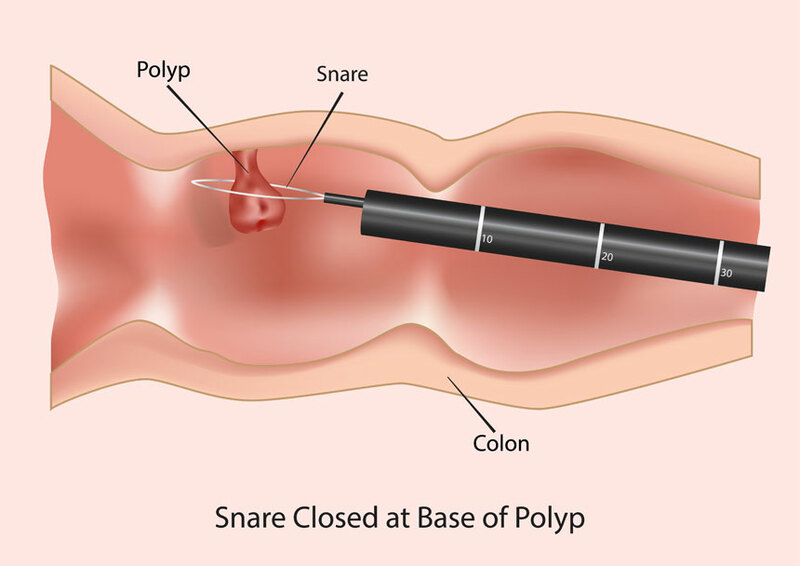 The polyp is then removed using a larger snare and electrocautery through the endoscope. The procedure is then called endomucosal resection (EMR). On some occasions such as very large polyps, polyps on the right side of the bowel which have a slightly higher risk of bowel perforation or in polyps growing in difficult positions in the bowel a combined endolaparoscopic procedure can be performed under a general anaesthetic. This involves the use of keyhole surgery (diagnostic laparoscopy) which is used to help the endoscopist remove the polyp with the endoscope by manipulating the bowel from inside the tummy and in cases of a small perforation this can be repaired directly. Removal of large polyps helps ensure that a small cancer has not already developed in the polyp and also prevents the polyps from developing into a cancer in the future. As per colonoscopy preparation and diagnostic laparoscopy. Polypectomy is generally a very safe procedure. Complications occur rarely and include the risk of bleeding (1 in 50), perforation or tear through the bowel wall that may require surgery (1 in 500), rare medication allergies and risk of heart attack or breathing difficulties. In some occasions further procedures may need to be performed or major surgery if a cancer is identified.